Okay, you've all seen this one before and I hate to admit it, but I've fallen head over heel for the Oskia Renaissance Cleansing Gel. Just like the Pixi Glow Tonic that I spoke about recently, I'm not normally one to give into the hype and I only tend to try products because I feel like I actually NEED them, so it took me a while to actually pick up the Oskia cleanser but I'm so glad I did! I've always been a bit sporadic when it comes to my skincare routine - some days I'll do the whole hog...cleanser, toner, mask, the works, yet other days I can be so lazy that I don't even bother with anything except a quick splash of micellar water! Since adding the Oskia cleanser to my skincare shelf though, my little pamper before bed has become something I really enjoy doing and there's rarely a day I go without now! Firstly, it comes in super luxurious packaging that is perfect for THAT Instagram flatlay (sense a theme here gals? ), and the pump is really handy as you don't waste product and one pump is just enough for the perfect cleanse. The only downside is there's not really a way to see how much product is left however I've had mine for just short of a year and it's only just starting to give up on me. You sold yet? If all that wasn't fab enough, what's inside is even better. I've never used a cleanser quite like it - it's a luxurious orange gel consistency that when applied to dry skin turns into a cleansing oil - but it one that works for so many skin types and it's one you can really feel working! It's full of alllllll the natural ingredients you can possibly want when caring for you face and it's stuffed with Vitamins A, B2, C and E as well as a big helping of pumpkin enzymes to really get rid of dirt and impurities and give your skin the best cleanse possible. In short, it ACTUALLY leaves your skin feeling super clean and looked after instead of feeling like there's still some nasties clogging your pores. I've never known a cleanser to be so hydrating too, so if you decide to be a bit naughty and skip the rest of your skincare routine, your skin will be soft and supple for a good few hours - Oskia's got your back gals! I won't lie though, it is a pricey little bugger at £29.50 for 100ml (available at Space NK and Cult Beauty) but like I said I've been using mine for nearly a year and it's only just running out! It's definitely a product that can't be replaced in my skincare kit, and I'll definitely be repurchasing this again and again as it's just such a luxurious treat for my skin day in day out and I couldn't recommend it enough! 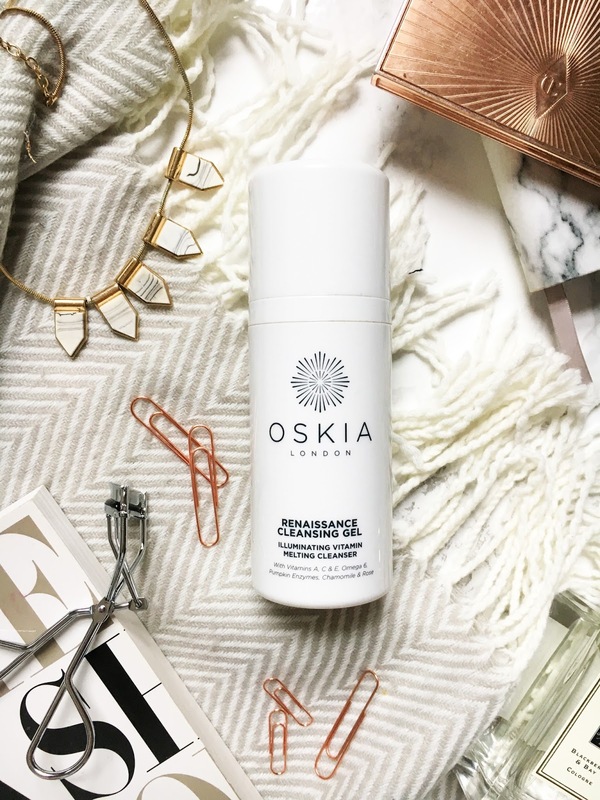 Have you tried the Oskia Renaissance Cleansing Gel? What's one product you'll always repurchase?